We stepped out of the train carriage at Rotenboden above Zermatt, Switzerland into the fog, shouldering our large backpacks. The other people on the train were women in fur-lined neon puffy jackets and men awkwardly clutching alpine skis. We asked the train attendant if the trail to Monte Rosa Hütte was that way, pointing vaguely into the fog, he just gave us an odd look. 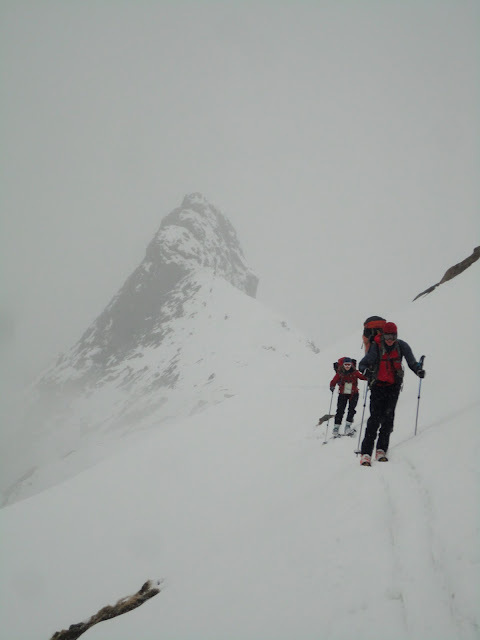 Nevertheless, Dad, my friends Astrid and Ivar and I set off into the fog, following a line drawn on a ski touring map and a description written in bad English found on some far corner of the internet. It was 4:30pm. Sunset was in two and half hours, and we had 6 kms to cover, mostly downhill according to our information. As we edged alone the steep side hill from Rotenboden, the Gorner glacier appeared intermittently below us in the fog. It was a long, steep way down, and we had to find a way down to it and cross it to find the hut. 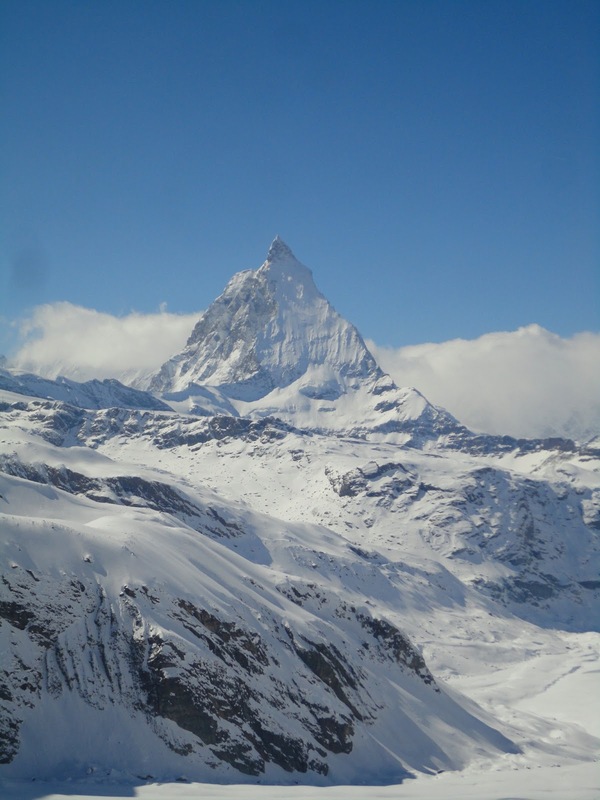 Behind us, Riffelhorn loomed, the only distinguishable point. I tried to imagine all the mountains around us, studying the map I had hung around my neck. From the traverse we should had seen Dufourspitze. We should have seen Castor, and Pollux. We should have seen the Lisskamm ridge. Soaring 4000-meters peaks should have towered above us. Instead we were encased in a soupy fog. All I could see was the steep slope above and below us that we had to traverse. A little while later, as we rounded a corner, a band of rocks appeared. 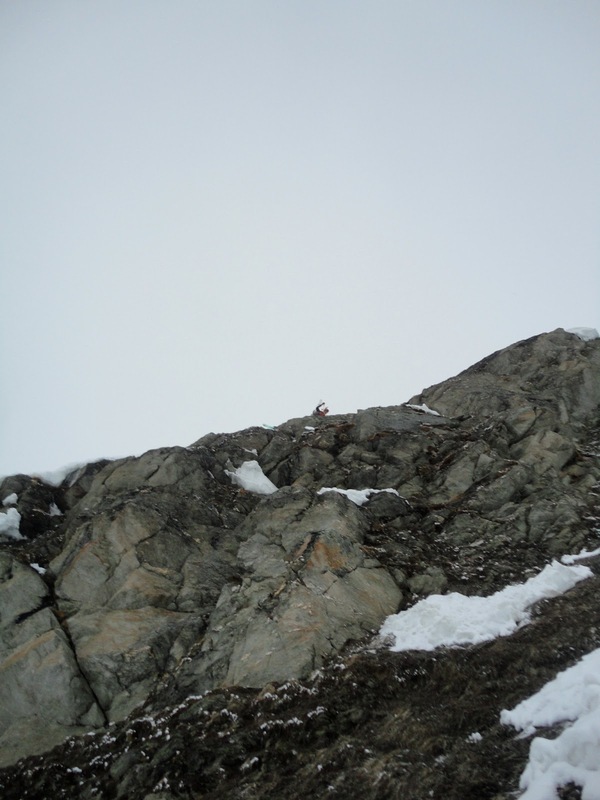 A string of chamois (mountain goats) ran up the hill upon catching our scent. I quickly snapped a few photos before continuing. I arrived at the band of rocks, and stopped short. Unlike several other bare spots we had hit on the traverse, this was much too long to cross on skinned skis. Also, it dropped steepy on the other side. "I'm going to take my skis off and look for a way down," I said to the others arriving behind me. I took a few cautious steps onto the slippery snow-rock interface and peered over the edge. The drop wasn't that big, and there appeared to be a way to step down. I walked out to the edge and tried to place myself to take the single big step to get down to the ledge below. After the ledge, you could walk out to the snow on the other side. The problem was that there was a drop of several meters below the ledge, which ended on some rocks. "I don't think I can do this with my backpack on," I called out. The putting the full weight of the backpack behind me as I made the rather large maneuver to the ledge below seemed like a bad idea. What ensued was an hour of messing around to get down the ledge. I came up to take my backpack off. We talked about how to get the backpacks down. We tried to lower my backpack off the drop next to the ledge, but it got stuck in some sharp rocks. We looked for a way around. There was none, at least that we could find in the fog. The longer the process took, the more nervous I became. View from below as Dad prepares to attempt to lower my backpack down. "Do you think we should turn back?" I said, voicing the thought we were all having. "Well, I don't want to have to redo that traverse on the steep hillside in the dark," Dad said. "Yes, if we can just get down to the glacier before dark, we'll be fine," seconded Ivar. "Right, then let's do this." I clambered down the ledge, and we formed a line of people to pass the skis and backpacks down. I ran back and forth with the gear, placing it out of the way on the edge of the snow field. Finally Dad, then Astrid and Ivar descended to where I was standing. As we all collected our gear, I snuck a peek at my watch, and a lump rose in my throat. It was 6:30pm. Sunset was in a half an hour, and we were still well above the glacier. 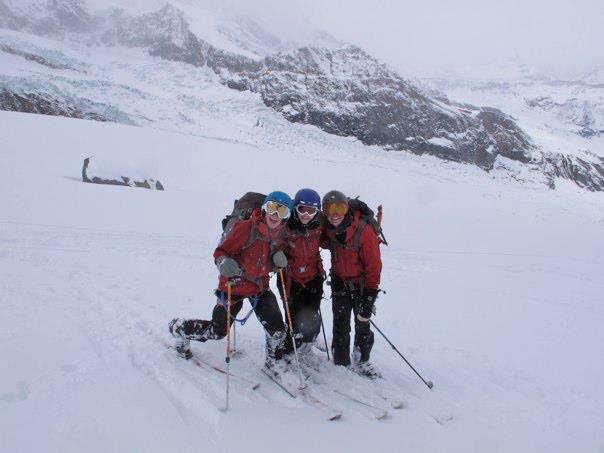 And from the glacier, we were only half way to the hut. 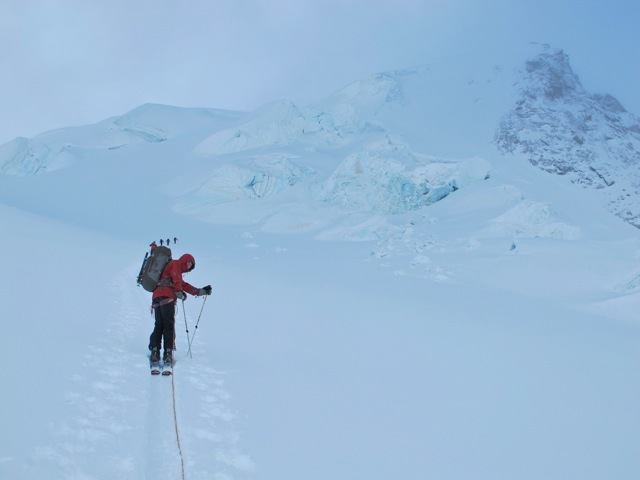 I swallowed the chilling reality that dark was coming as we descended to the glacier on the rotten, punchy snow. I played Worst Case Scenario. What if we have to spend the night out? I imaged myself, shivering on this steep slope in the dark, unable to get down. We have to get down to the glacier before dark. Dusk began to shroud the misty landscape with deeper nuances of grey, and still we descended. Ivar prepares to head onto Gorner glacier as night falls. We arrived at the edge of the glacier in the last rays of light, mercifully still following a lone set of ski tracks headed in the right direction. I turned on my small headlamp and began to follow the tracks. I was still a little scared, but at that point the only way was forward. I began to sing to myself, trying to find strength in the falling night. The glacier was rolling at first, and then began to climb steadily. I lost track of time, but I remember seeing a yellow glow in the distance, far above us. The hut! According to our GPS, we still had more that 300 vertical meters to climb. Sigh. We rounded a corner and the hut disappeared. Then we hit The Wall. 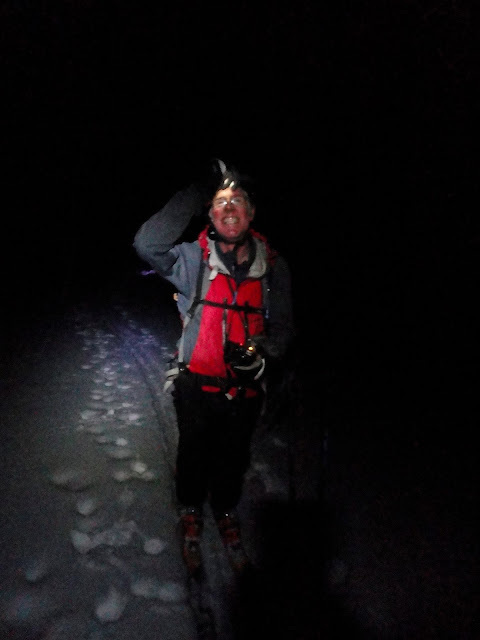 Shining my headlamp up, I saw switchbacks heading up a steep, thirty-degree pitch. In the limited light I couldn't see the top. So I pulled a Thomas the Tank Engine (I think I can, I think I can, I think I can) and headed uphill. On the way up, the wind picked up and the amount of snow drift in the tracks increased. Finally, I pulled to a halt and turned to tell Dad that the tracks had disappeared, my voice quivering. The tracks had been our best chance at not having to spend the night out, and they disappeared. Luckily the tracks reappeared in the same direction 10 minutes later. Me and Dad finally pulled into the hut around 10pm, and 30 minutes later Astrid and Ivar arrived safe as well. We dug into a well-deserved hut dinner and fell into our beds exhausted. We woke to a much clearer day. The top of the Matterhorn in the clouds, and Gornergletcher stretched out below Monte Rosa hut. The traverse we made the night before was above the distinct band of rocks to the right in the picture. The twins, Castor and Pollux, above their Twillingegletcher. 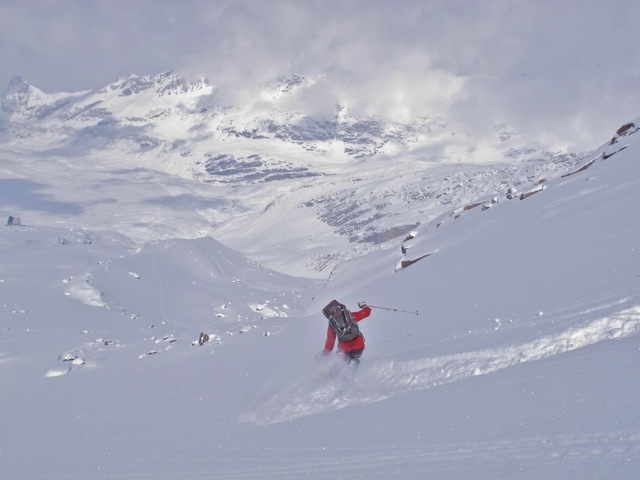 After a leisurely breakfast, we set out for an acclimatization ski, reveling in all of the mountains that we could finally see. We turned before lunch as the light grew flatter, and enjoyed some good fun downhill skiing back to the hut. At lunch, I started to feel the side effects of the day before and the altitude, and on our afternoon acclimatization tour I felt incredibly heavy and slow. I was glad to sleep an hour before dinner. The next day was spent in a white out. Anyone who has been hut bound knows what this means. Basically you eat a lot, play whatever card game you have on hand (in this case Uno) until you hate each other, and your sense of humor grows increasingly crude as the day grows on. It was all great fun, although I started to grow pretty restless. The forecast for the next day was great, and so we told the hut staff we would take an alpine breakfast - at 4am. Astrid said she wasn't sure about the high altitude of the peak, and Ivar had to meet his friend Rasmus on the glacier, so that left me and Dad to mount a summit expedition. 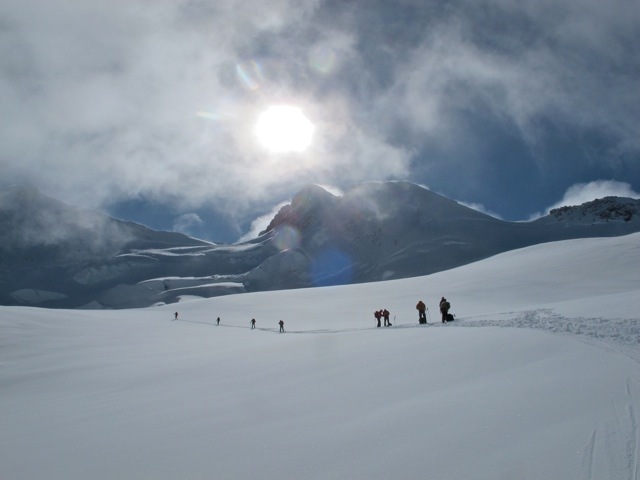 At 05.38am the Strazilchek Dufourspitze Summit expedition set out from Monte Rosa Hütte. The weather was not as promised; in fact, it was snowing hard. But two other groups had set out, hoping the day would clear off, and so we headed out, following their tracks. It's a completely different feeling to head into the predawn than into the night. It was completely dark out when we left the hut, but just knowing that dawn was coming in a few short hours made the experience more cheerful than the nighttime hike up to the hut. Sparkly snowflakes danced in the beam of my headlamp, and I felt strong from a day of acclimatization followed by a day of rest. I was ready to give the highest peak of the Monte Rosa massif, Dufourspitze (4634m) my best shot. By the time the sun rose, we had climbed nearly 600 vertical meters and were starting to climb more slowly with the altitude. The altitude and the sunrise also brought a bone-chilling cold. With all of my layers except my big down jacket on, I was just barely warm enough as I skied up the hill. The Austrian and Swiss expeditions on the mountain, Dufourspitze in the background just below the sun. There were three other groups heading up the mountain, and all of us basically hiked upward in a train of people. (Mercifully some of the others broke tracks). Dad and I, not be extremely experienced in glacial travel, played follow the leader. So we the other groups stopped and roped up, so did we. We headed slowly but steadily up the glacier, until we came to the last the steep pitch before Silbersattel, the saddle where you leave your skis to hike the last bit to the top. I stopped short; this last part of glacier was not just a steep snow slope as I had imagined but a gnarly, crevassed glacier surrounded by steep, ice covered walls that seemed in danger of falling at any moment. "Unless I see a safer way up this than I see right no," I exclaimed, "I'm not going up there." The final glacier up to Silbersaddle. Would you go up this? We stayed were we were, at 4200 meters, and watched the other groups heading up. I didn't see a safer way, really. 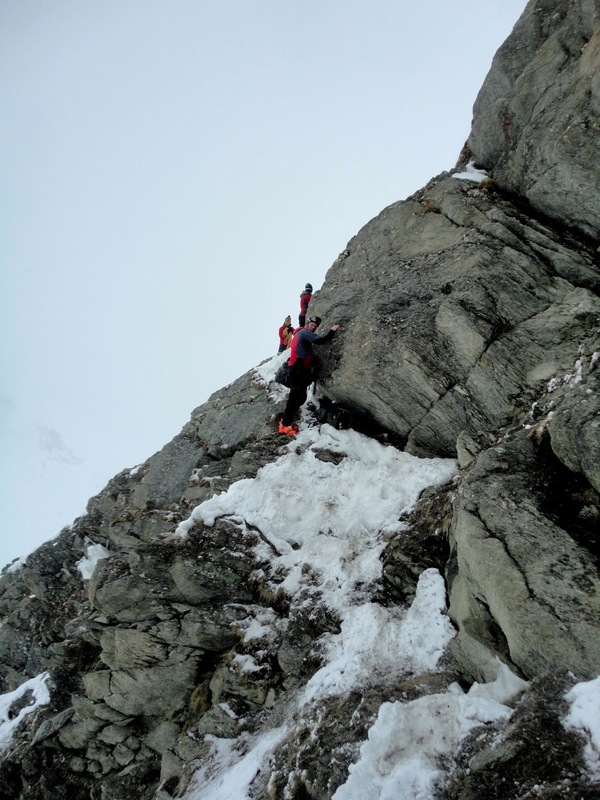 We decided that our inexperience in glacial travel would be the deciding factor; the risk of falling in a crevasse was too great for us to go further up. So we turned. As soon as we had gotten our skins off and headed down the mountain, the clouds came down and we were left in white out. Dad suggested that we should ski roped up, just not to lose each other. Skiing in a white-out attached to each other by a 15 meter rope is an odd experience. I had to focus on two things: not losing our uphill tracks, and doing even, predictable turns so that Dad would be able to follow me easily. We had a couple of jerky falls on the rope, but in the end we were skiing quite nicely. I felt like a 4-year-old in a ski area on a leash. 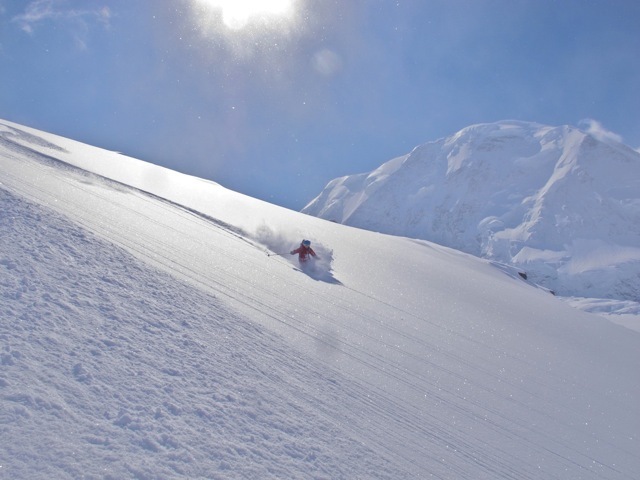 When we finally got of the glacier, the landscape cleared off and I could finally really rip in the fresh powder. I felt great; we did, after all, get first tracks down the whole mountain! Dufourspitze, with our downhill ski tracks down the lower section. About a half an hour later, the other groups came skiing down to the hut. 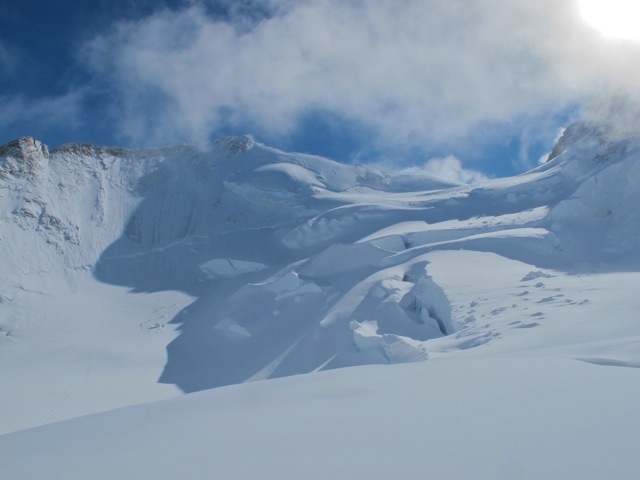 They had found the upper glacier to be impassable because of loose snow, avalanche danger and crevasses, and had turned not long after us. So in the end, no one got to the top that day, and the right decision was made all around. 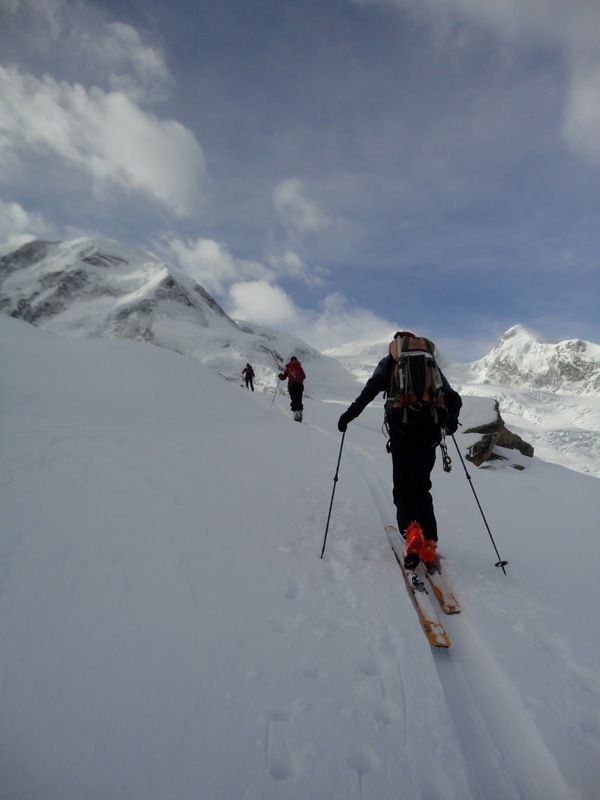 In the afternoon we enjoy a scenic, if flat, ski out on the glacier to Zermatt. The last part, down the ski pistes, was a maze of tourists. As we walked the streets of Zermatt, we felt odd and out of place with our big backpacks and ice axes. A man even stopped us in the street and asked, "Are you coming from Chamonix?" to which we had to disappoint him. We later joked that we should have answered, "Yeah, 36 hour traverse." P.S. The photo credit to about half of these pictures, including most of the ones of me, goes to my father Richard Strimbeck.